Did Bernie Sanders know famed bank robber Willie Sutton, who is supposed to have said that he robs banks because that's where the money is? Brooklyn-born Sutton, who denied saying the above, died in 1980 at the age of 79. 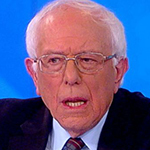 Brooklyn-born Sanders apparently took Sutton's purported aphorism to heart with his decision to hold a town hall sponsored by Fox News on April 15 in Bethlehem, PA.
Much to the chagrin of the Democratic National Committee, The Bern plans to do Fox because that where the voters are, an especially important group in a swing state like Pennsylvania. DNC chair Tom Perez issued an edict March 6, declaring that Fox News would neither host nor televise the party's presidential primary debates. He made that move in a fit of pique following Jane Mayer's takedown of Fox in her New Yorker article, in which she branded Rupert Murdoch's pride and joy as nothing more than a propaganda arm of president Trump. To that bombshell revelation, Bernie replies, "Duh." The Vermont Senator distinguishes between propaganda machine Fox and its viewers. A Morning Consult/Hollywood Reporter poll released today finds that 70 percent of Republicans consider Fox a "credible" news source. That's far better than the Democratic-leaning New York Times and CNN, both of which have withstood withering almost daily "enemy of the people" rants by Trump. Republicans swallowed Trump's tirades hook, line and sinker as the credibility ratings of the NYT and CNN plunged 20 points since the 2016 election to 32 percent. Sanders understands he won't win new voters by preaching to the NYT and CNN choir. He becomes a more credible candidate, in the eyes of the GOP, just by showing some guts and appearing on their most trusted network. "If you check where I go, and where I will go into this campaign, I’m not just going to go into blue districts. You’ve got to go into areas where people are. Working people need to know the truth, and that is that Donald Trump betrayed them, lied to them. And I intend to do that." The DNC says it doesn't have a problem with Bernie doing Fox. The Senator, though, probably doesn't give a fig about the DNC. He believes establishment hacks at the DNC did everything they could to rob him of the 2016 nomination and hand it to Hillary Clinton. In appearing on Fox, The Bern burns the DNC and may pick up some voters as a bonus. That's a win-win.